Even with only a few days to go until the April 12th launch of the HTC 10, it's likely that a few twists and turns still await us. HTC has spent the past few weeks talking up the device's camera capabilities, which, according to the company, will be of 'world-class' proportions. Then again, this is the firm that has made similar promises in the past and yet, by and large, failed to deliver a truly great shooter. So strong is HTC's apparent desire to rectify this, however, that the front-facing camera could feature optical image stabilization (OIS). You don't have to look very hard to find people taking pictures of their own faces. Selfies are more than just a thing now, and smartphone manufacturers have responded accordingly by beefing up the capabilities of front shooters. Though we've already seen selfie cameras with flash, wide-angle lenses and myriad treats usually reserved for the main shooter, OIS would be quite the eye-opener. A Twitter account under the handle @testingsmiles shared a few sample images earlier alleged to have been captured on the HTC 10's front camera. The snaps show a guy holding a device (supposedly the HTC 10) at the end of a selfie stick and taking pictures in exhibition-like settings. Some of the shots feature HTC's branding, including the hashtag #powerof10 and the date of the launch event. Accompanying tweets also mentioned that OIS would be 'a world first' for a front camera. All of the images and associated info has since been hauled off Twitter. Luckily, the good folks at Phandroid have rescued the snaps, which you can check below. Since these have been pulled from Twitter which, like most social networks, compresses uploaded images, it's hard to take much from them if anything. But if there's any truth to this and HTC 10's front-facing snapper is to include OIS, selfie fans could really have something to savor. 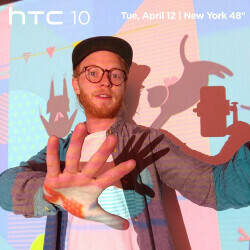 Really hope fourth time is a charm for HTC. Worst color painting noise reduction mess from a front camera in years. Need to have your eyes checked. did not see the heavily compressed from twitter i guess? how many times do your mother told you to get out on that mirror! front cameras are mostly s**t.. even my S7 edge takes not so great picture from front camera. even pictures from Nexus 6p is better.. So he's obviously in front of a projector... The pastel color is horrible to show off the camera though. Not sure what they were trying to show with this lighting and color situation. Pics are pretty crisp for a front shooter, under strange lighting conditions....I think. I guess they wanted to show the crisp image that you mentioned. Horrible to show but it still looks great! If it was an official-unofficial leak.... They sure picked some strange pics to show off the camera. The new standard of measuring a smart phone. How does the camera perform? You may be correct, it seems like no one uses their phones to make calls anymore. Well, should a smartphones quality and usability be measured in how it performs when doing a simple call or text? Those are basic features that all modern smartphones do just fine. M7 M8 M9 all had better call quality than Samsung equivalent. And the best loudspeaker for calls. So i expect the 10 to be as good if not better. Barf on you Richard the samsung troll. I would love to see how the front camera perform in normal day light or low light condition without any helps from bright light and in this case that guy standing in front of projector. Looks good to me. I'm excited for the 12th.